BlackBerry released its BlackBerry Messenger app in open beta for Windows Phone on Thursday, taking it out of the private beta stage. 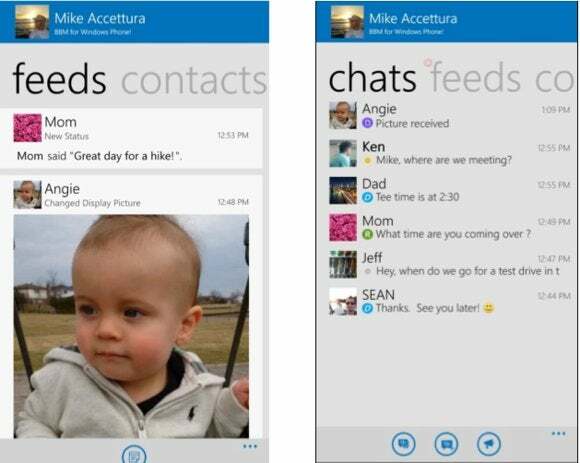 Users can now download the BBM Beta app from the Windows Phone store. It’s not a universal app, however, so it will work only with Windows Phone—either Windows Phone 8 or the new Windows Phone 8.1. BBM, long limited to BlackBerry devices alone, was downloaded more than 10 million times in the first 24 hours it was available for Android and iOS, in October 2013. BlackBerry released the app in private beta in June, saying it would be available in July. The app does what you’d expect, allowing users to shoot messages, files, and pictures back and forth, complete with indicators when an message has been read or is in the process of being responded to. The BBM for Windows Phone interface focuses on three key areas core to the BBM experience: Contacts, Chats and Feeds, which can be accessed by swiping left and right to access all three screens. The Contacts function is self-explanatory, while Chats is reserved for electronic back-and-forth with your friends. On Feeds, you can see when a contact has updated his or her status or photo. “We’ll be working to quickly add more features to BBM for Windows Phone such as stickers, BBM Voice, BBM Channels and location sharing powered by Glympse in the months ahead,” BlackBerry said in early July. Those features will apparently be wrapped up into the version 2 of the app, which BlackBerry makes reference to in its product description. For now, there are perhaps dozens of ways to communicate via instant messenger on smartphones, but far fewer on Windows Phone. With BlackBerry continuing to freefall, and Windows Phone also stuck in a niche behind the dominance of Android, companies appear to be migrating their key services back and forth.